That's some pretty work. What color is that? Beautiful work! 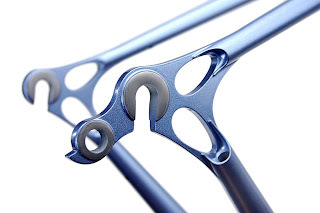 Those cutout dropouts look cool, but they are almost fragile looking. 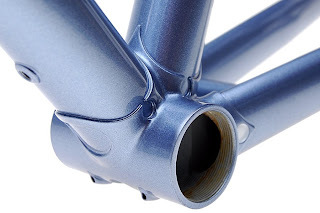 The internal chainstay routing is awesome. Best rear drop outs I've ever seen. It's "seascape blue". Thanks for the love on the dropouts, I agree, they are fragile looking, but I logged two seasons on a pair that I hand cut and which were probably even thinner. 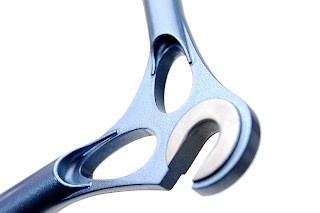 I designed them to work for a 953 bike which has very large minor end on the stays, then I don't need to cut back as much metal to blend them. I took an order for a 953 bke recently, so they will be put to the test, stay tuned for pictures.